Neurulation ends when the neural tube closes. The neural tube then begins a considerable amount of morphogenesis, that is, changes in shape and size. The brain especially rapidly changes. The brain elongates, bends and folds, and expands greatly. Following are some examples of these changes. These studies were done in the Jacobson laboratory using chicken embryos. Chick embryo stages referred to are those of V. Hamburger and H.L. Hamilton (1951) A series of normal stages in the development of the chick embryo. J. Morph., 88:49-92. In bird and mammal embryos, neurulation proceeds cranial to caudal, so the cranial end has formed a tube while the posterior end is still neurulating. Any fluid collecting within the tube can exit through the caudal neuropore. The walls of the cranial spinal cord soon become opposed, allowing fluid to accumulate within the brain cavity and blow the brain up like a balloon. At stage 11 the brain cavity is open to the posterior neuropore. 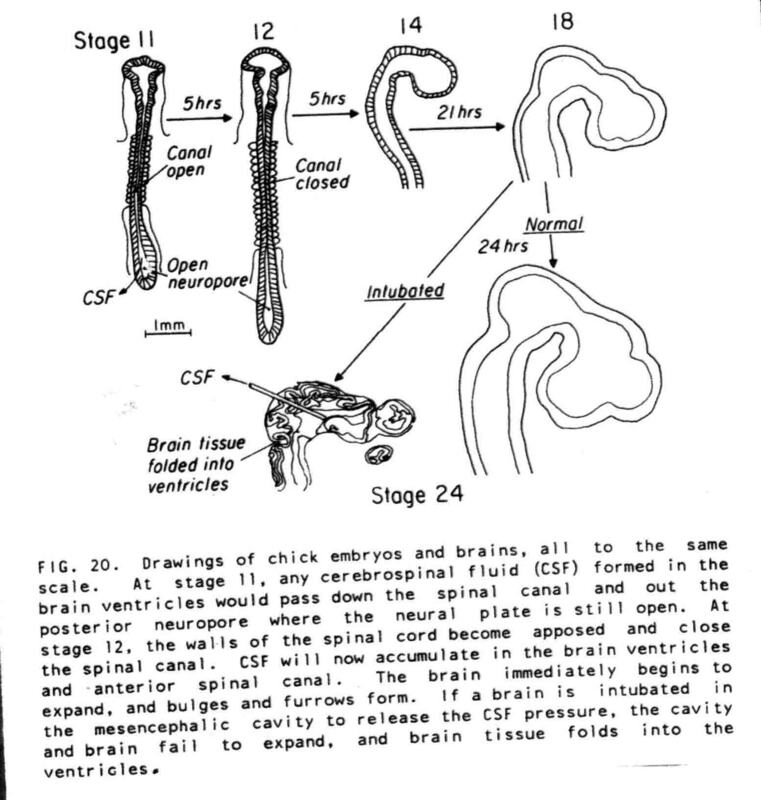 Five hours later at stage 12, the spinal cord walls in the neck region become opposed and the brain begins to blow up. Five hours and two stages later, the brain is much enlarged, the cephalic flexure has begun in the mesencephalon and the ventral bulging of the prosencephalon emphasizes that flexure. The bulging and furrowing of the expanding brain looks much like making animal figures out of a balloon by preventing expansion where a furrow is desired. By stage 18, 21 hours later, the brain is sufficiently expanded to allow the placement of a capillary tube into the cavity of the mesencephalon, allowing the confined fluid within to drain. In the next 24 hours, the brain tissue collapses in the intubated embryos. Normal embryos, or control embryos with a solid rod rather than a tube emplaced, continue brain expansion normally. Fluid pressure within cavities is a mechanical force in development of embryos. Resulting brain expansion in bulges may stretch cells, initiating cell division and in these cases growth. Next is a study of cephalic flexure by Gail Goodrum (G.R.Goodrum and A.G.Jacobson, Cephalic Flexure Formation in the Chick Embryo. J. Exp. Zool. 216:399-408 (1981)). Cephalic flexure is a feature found in all vertebrate brains. This flexure is a ventrally directed bend through the mesencephalon and a ventral bulging and elongation of the prosencephalon. Experiments isolating the mesencephalon showed that adjacent brain parts are not necessary for mesencephalic flexure, nor is intracranial fluid pressure. Measurements of the angles of flexure found that the period of greatest flexure occurs between stages 12 and 14, and the entire period of flexure is stage 10 to 15. One might expect that the roof of the mesencephalon would thin during flexure while the floor thickens. The opposite is true. Between stages 10 to 15, the roof thickens 275% while the floor thickens 173%. To flex, the roof of the mesencephalon must enlongate more than the floor. It does so five times more between stages 10 to 15, but between stages 12 and 14 when 86% of the flexure occurs, the roof elongates 25 times as much as the floor. Since most people invoke differential growth to explain cephalic flexure, we measured the dorsal and ventral volumes of the mesencephalon. Dorsal volume increased 46% and floor 5% during the stages of most rapid flexure, stages 12 to 14. So it could be differential growth. 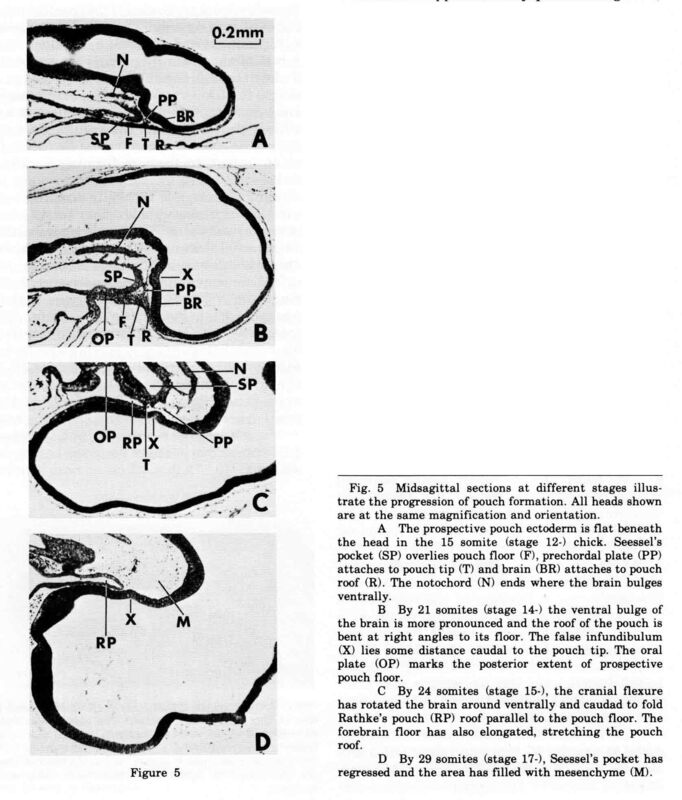 However we measured dorsal and ventral volumes of prosencephalon during the same stages 12 to 14. Roof volume increased 34% and floor 11%, but the prosencephalon did not flex. Growth alone is not an adequate measure. Differential growth may be necessary for mesencephalic flexure, but other factors that decide the disposition of the products of growth in space must determine the shape. During these early periods of brain expansion and flexure, the epidermal rudiment of the anterior pituitary gland, that is, Rathke's pouch, is formed. The importance of the anterior pituitary as an endocrine gland caused many to study its development. Doskočil reviewed the large older literature on the chick pituitary in a monograph in 1970 that contains 187 references spanning 194 years (M. Doskočil (1970) Development of the Chick Hypophysis, Acta Univ. Carol. Med. Monographia XI. Universita Karlova, Praha, C.S.S.R., 131 pages). We have studied the morphogenesis of Rathke's pouch (AG Jacobson, DM Miyamoto, and S.-H Mai, Rathke's Pouch Morphogenesis in the Chick Embryo. (1979) J. Exp. Zool., 207:351-366.). In the midline, just in front of the anterior end of the neural plate, an epidermal placode forms that will become the tip of Rathke's pouch. The pouch forms the anterior pituitary gland. The posterior pituitary gland is derived from an associated extension of the infundibulum that evaginates from the base of the brain. The body folds of the embryo create a deep sub-cephalic pocket beneath the head. As the neural plate is folding into a tube, the neural plate and folds extend anteriorly and fold and reflect the most-anterior parts of the forming tube beneath the head. This is best seen in scanning electron micrographs (below). When the ventral neural ridges fuse, the future roof of Rathke's pouch lies along the line of suture. The epidermal pouch roof remains strongly attached to the brain floor. The future floor of Rathke's pouch lies along the midline, extending from the tip of the pouch toward the oral plate. Above the pouch floor is the preoral gut (Seessel's pouch). 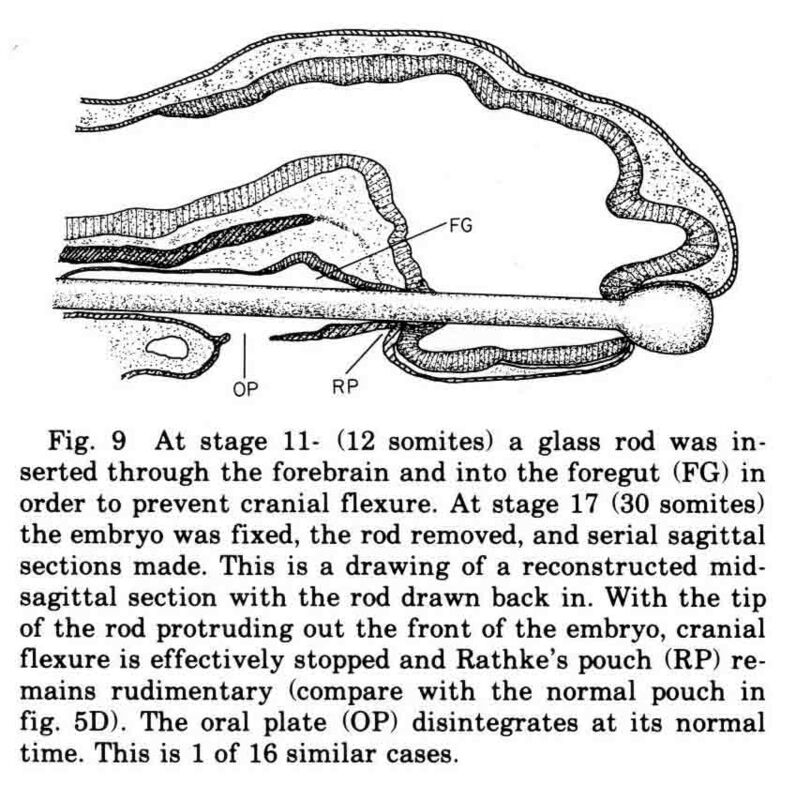 The prechordal plate ends at and is anchored to the tip of rathke's pouch. So the pouch rudiments are attached to brain floor, prechordal plate, and Seessel's pouch endoderm. These attachments hold the pouch parts in place when cephalic flexure bends the brain ventrally and back upon itself (see below). Most textbooks say that Rathke's pouch invaginates from the oral ectoderm. Our observations and experiments give a different explanation for the chick embryo. We find that the roof, tip and floor of the pouch lie flat along the midline (A above), then the cephalic flexure through the mesencephalon as well as the downward bulging of the prosencephalon wrap the floor and roof around the tip of the pouch. We find that mesenchyme, mostly from mesencephalic neural crest, collects beneath the ectoderm lateral to the floor plate (and to some extent lateral to the roof plate) causing the walls of the pouch to form when the ectoderm lateral to the floor plate fuses with ectoderm lateral to roof plate. The essential role of cephalic flexure in pouch formation is seen when a glass rod is inserted though the brain cavity and foregut which prevents flexure. The pouch then remains but a dimple (see below). Other control experiments were done to make this point. 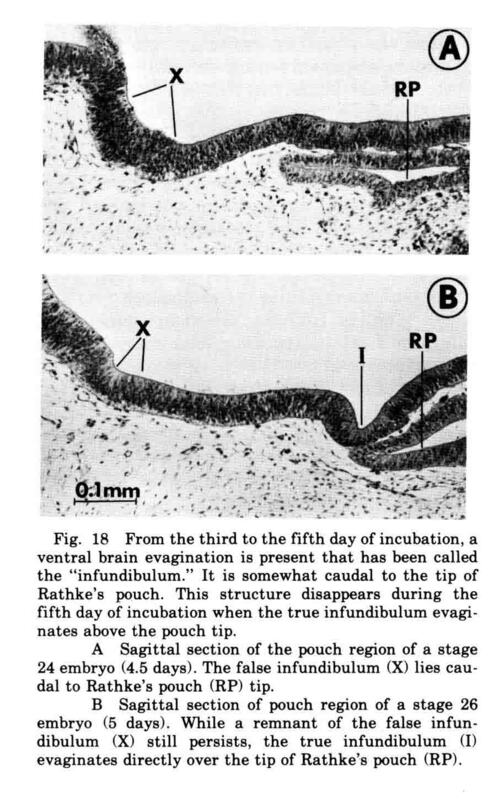 Doskočil pointed out that a ventral evagination from the floor of the forebrain during Rathke's pouch formation ('X' two figures up) is not the real infundibulum from which the posteior pituitary forms. We confirm Doskočil's finding. This early brain evagination, seen on the 3rd and 4th days of incubation, is a transient structure. The real infundibulum appears on the 5th day of incubation, forming directly above the tip of Rathke's pouch. Some observers suggested the pouch elongates to make contact with the false infundibulum. That is false. We found a time when the false infundibulum is still regressing and the real infundibulum is forming and a picture of the two present at the same moment is shown below. Some interesting questions arise from the events described above. When the anterior end of the neural plate extends and reflects beneath the neural plate, two parts of the brain floor are placed in apposition. The literature says the doubled floor parts withdraw or more likely lyse. The end result is that both top and bottom of much of the chick forebrain is 'dorsal' alar plate. The forebrain has no floor plate and no basal plate either. This early brain folding, followed later by the cephalic flexure, turns the rudiments of the telencephalon ventral and caudal. The future nasal placodes are also displaced ventral and caudal.